I will be listing a large quantity of toys over the next few weeks. Check out my other auctions for many more 1950's - 1960's Japan boxed battery operated and friction toys. Very scarce 1950's Japan tin battery operated Ball Playing Bear toy with original box. This toy has colorful lithography all around with nice graphics. It is of all tin construction, with celluloid headed bear, celluloid duck, celluloid balls, and a tin spinning umbrella with 5 hanging celluloid birds. The battery box is very clean. There is an on/off switch for this toy, and when you turn it on the toy the balls cycle up through the tower and down, the umbrella with birds spins, and the duck moves! The toy is marked MADE IN JAPAN. The litho is still super clean and glossy with almost no wear. It measures 10.25" tall to the top of the umbrella, the base is 6.25" x 4 5/8. It comes in the original box with nice image of 2 bears playing ball on the cover with other animals around them. CONDITION: The toy is in glossy condition with very little wear, and all functions still work great! There are no dents or cracks to any of the celluloid. The box is very solid with some very slight bowing in of the lid, and slight creases at the upper corners of the lid. The box bottom is fairly solid, but does have a break-out at one end, some reinfrocement on the inside at that corner, and a cut-out V at one end of the box bottom. Auctiva offers Free Image Hosting and Editing. 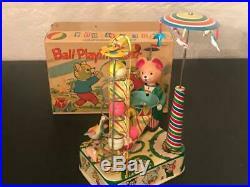 The item "Rare 1950's Japan Tin Battery Op Toy Ball Playing Bear in Original Box" is in sale since Friday, March 22, 2019. This item is in the category "Toys & Hobbies\Vintage & Antique Toys\Tin\Other Vintage Tin Toys". The seller is "treasuresof-yesterday" and is located in Webster, New York. This item can be shipped worldwide.